Do Your Hobbies Make You Rich? Not a good start with bicycling last week. When I received the box, I noticed it was a bit banged up. Opening it up I noticed some slight damaged with the basket, but I hoped I could fix that up. I then pulled out the pieces to put it together. After grabbing socket and wrench sets, I was able to build it to the point where I realized I was missing a few vital bolts and screws. Disheartened, I submitted a return to Amazon. They said they would send another bicycle and I would have to get the defective bike ready for pick-up this morning. While assembling the bicycle (and disassembling when I had to get it packed for the return) I got a bit energized from engaging in a hobby I hadn’t done in awhile. A hobby is a regular activity or interest that is undertaken for pleasure, typically done during one’s leisure time…..Engaging in a hobby can lead to acquiring substantial skill, knowledge and experience. For some playing video games or sports, doing word puzzles, or creating art or some crafts. My hobbies have changed as I’ve grown older (with the exception of reading – I’ve always loved grabbing a good book). My current hobbies have been more technically based – either messing around with the computer, tinkering with site design or playing a strategy based video game. It allows me to relax after a long day. With a toddler ( time has flown!) now, I’m limited a bit on my time spent on hobbies. I’ve also realized that I’d like to get back into hobbies that are more productive, meaning I can relax and do something that help the family. Being a personal finance blog for couples, I would be remiss if I didn’t mention a few possible hobbies that can help you improve your finances. Gardening: Not simply an old person’s hobby (lol! ), gardening can save money as you grow some of your own food. Cooking: So many people have a love/hate feeling about cooking. I used to see cooking as a necessary chore. As I’ve cooked more and more, I’ve discovered that I enjoy trying new tastes. My husband has gotten into grilling this year and love sit. It’s better for our wallet and our waists. Home Repairs: Being able to fix things around house is incredibly helpful. Calling a plumber for very basic repair can empty your wallet very quickly. Woodworking/Metalworking: I have a couple of friends who have the talent of creating items like bookshelves and dining tables by their own hands. Crafts: I know a family friend who has turned her knitting hobby into a little extra cash. I also know someone with a love of crafting that has creating an incredible shop of plush animals, hair accessories, and more. Writing: That’s a hobby that became an income stream for me. Writing online and blogging has given me an opportunity to start a small business. Is this a complete? By no means, but I think these are hobbies that most people can start out with and build from there. Jacob from Early Retirement Extreme has a much bigger list if you need some more ideas. 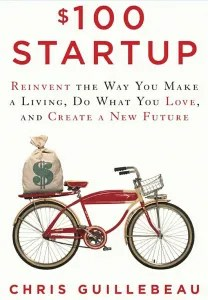 For those who already are engaging in a hobby and have made a bit of money with it, you may want to check out Chris Guillbeau’s book The $100 Start-Up. Borrow or buy, it’s a really good resource for those looking to make the leap from employee to entrepreneur. I’ve been a fan of Chris for years and I’ve enjoyed his guides on building a small business including his Empire Building Kit. Of course there’s no rule that you need to turn a hobby into a business, but it’s nice to know you have that option. What hobbies to you enjoy that also saves or makes you a bit of money? Where did you pick up that skill? What hobby do you wish to pick up? Good question that many folks should ask, but probably don’t. I think a lot of people take on very expensive hobbies without regard for opportunity cost. I may spend time on hobbies, which is valuable. But in terms of financial costs? I find hapiness in hobbies that aren’t super expensive, and this is because of self-discipline. Some things in life, such as family and health, are more worth my time, energy, and money than pricey hobbies anyway! My wife is a music teacher. Although it’s definitely more of a job than a hobby, being proficient in music has amazing opportunities for freelance money. There are tons of people looking for teachers and tons of people looking for performers. The possibilities are nearly endless; although not likely to make you rich. My sister tried photography with a small digital camera after she retired 5 years ago. She enjoyed it so much and was so good at it that her photos have won awards. She sells them in a cooperative gallery, and she has made enough money at her hobby that she’s had to declare the income on her taxes. She’s never focused on the money-making aspect, although making enough to buy better equipment is great. Dog walking is one. If you are taking your dog out anyway why not get paid to walk other peoples? Next Post: Counting Down to #FinCon12!